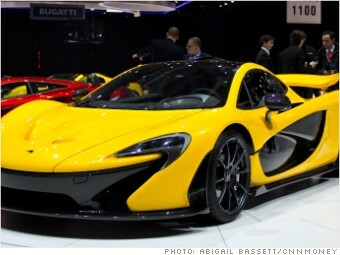 Watch: McLaren P1 - A million dollar hybrid supercar. British supercar maker McLaren unveiled the final production version of its new P1 performance car at the Geneva Motor Show. The car, which will have a $1.1 million price tag, is powered by an ultra-high performance hybrid system. The P1 has a 3.8-liter V8 engine that, together with an electric motor, can produce a total of 903 horsepower. The engine is similar to the 616 horsepower engine in McLaren's current model, the MP4-12C, but with some performance enhancements including bigger turborchargers.